Photoshop i all ära, det vore bra med ett bildprogram med lite färre funktioner som inte kostar lika mycket. Och varför inte göra det riktigt snyggt också? Nu har några gjort just det. Programmet heter Pixelmator och kostar 59 US$ och verkar mycket bra. Endast för MacOSX. How is Pixelmator different from other image editing applications? 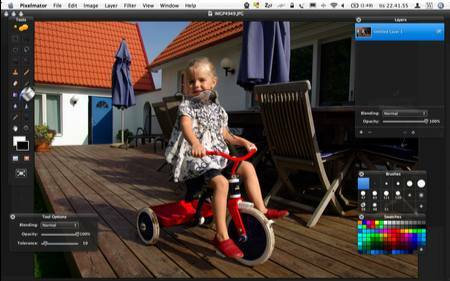 It’s very different from other image editing applications because it’s the first application of its kind to take full advantage of your graphics card (GPU), it supports the latest and greatest Mac OS X technologies, and it features a transparent user interface designed for work with images. In other words, Pixelmator is an innovative, very easy-to-use, next-generation, real-Mac OS X image editing application. This entry was posted on Tuesday, September 25th, 2007 at 21:56	and is filed under Apple, Foto, Spanat. You can follow any comments to this entry through the RSS 2.0 feed. You can leave a comment, or trackback from your own site.